Syracuse’s biggest strength is its firepower up in the front. They’ve been super hot of late but haven’t been challenged as hard as some of the other teams. They have guys that coming around at the right time like Joe Dragon and Aidan Tooker. Their low sticks of Justyn Knight, a probable individual champion, and Collin Bennie are bona fide veterans. They have a good balance of maturity/experience and youthful exuberance. Sometimes when you’ve never been to NCAAs, I feel like it could be polarizing. You’re either so naive that you don’t realize what you’re experiencing and you’re great or you get way in over your head and you fail. There’s rarely a middle ground for freshmen. I think a lot of it will come down to how their young guns like Tooker or someone like Dominic Hockenbury or Noah Affolder. 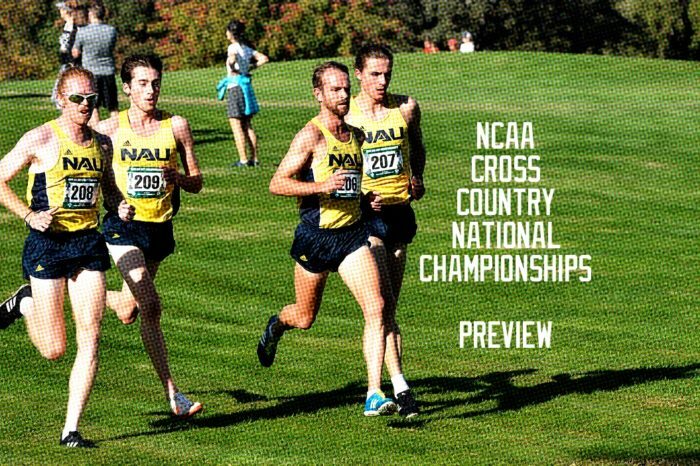 Bennie and Knight are possible top 10 guys like how NAU has it’s low sticks set up. If the next three guys rise up to the occasion, they could sneak in and get the win based on how the other teams run as well. If their young guys get overwhelmed and run poorly or not as great as they hoped, then Syracuse won’t win. A lot is riding on the younger members of the team to step up. It also comes down to the fact that BYU and NAU may be better teams on paper. Syracuse would have to run its best day of the season with BYU and NAU not having its best day in order to win. Aidan Tooker showed off some great Twitter fingers. Just look at the numbers on this tweet. Now, it’s up to his legs to do some talking. Last thing, shout-out to J-Knight. One of the nicest guys in the NCAA from my interactions with him and observations.